Cherry Mobile Flare is a Karbonn A9+ from India, Rooting a Flare is the same instruction on how to root a Karbonn A9+. Snapdragon 1.2 GHz Dual Processor by Qualcomm. Superior Processor. Strong Performance. 5.0 Megapixel Camera With Smile Shutter, Wink Shutter, Face Effects, and Multiple Camera Modes. Android Ice Cream Sandwich 4.0. Create your own mobile world filled with the hottest apps and high-powered features. Gain access to over 300,000 apps in Google Play. Capacitive Large LCD: Vibrant resolution and intuitive mulit-touch screen. 2. 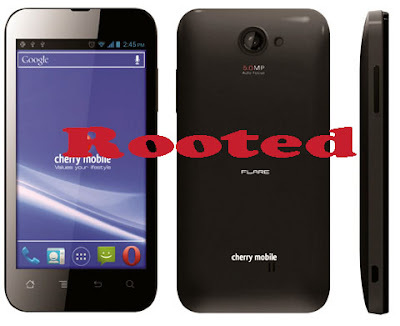 Download Root by Bin4ry Tool. 5. Unzip the file you have just Downloader and On the folder find the "RunMe.bat" and Double Click it to run. 6. In the command prompt window, Press 1 (Device = Normal) when it ask the device type. 8. After the device reboot, The command will copy some important files to your phone, You don't have to do anything unless it says the operation is successfully completed. 9. Disconnect you device and reboot. 10. Then try any apps that required root. 11. Done, Congrats your flare is now rooted. have fun with it.